These simple yet impressive scones are perfect for the holidays (recipe here). 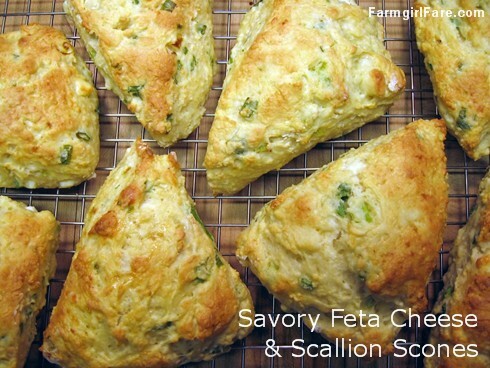 I created these Savory Cheese and Scallion Scones during a 1993 scone craving when there was no butter in the house, and they've become one of my most popular recipes both online and off. I brought them to a big Thanksgiving feast last year and they were a huge hit. Made with softened cream cheese in place of the butter, they're light and moist on the inside, with a pleasant little crunch on the outside. They're perfect for the holidays, but they mix up so quickly you don't need to wait for a special occasion to serve them. Offer them warm from the oven instead of rolls: plain, buttered, or with cream cheese, goat cheese, or homemade herbed yogurt cheese. I like to split and toast them in the toaster oven for breakfast, then slather both crunchy halves with butter. They're great for making little sandwiches, and I've even used them as burger buns. They also freeze beautifully, so you can make them now and serve them later. Defrost them at room temperature and heat at 375° for about 5 to 8 minutes. Not a feta fan? You'll find the chive and sharp cheddar version here. Still not sure about this recipe? Maybe these rave reviews from Farmgirl Fare readers will help turn you into a savory sconehead. Thanks so much to all of you who take the time to comment on my recipes. And thanks for pinning them on Pinterest! —These scones are fantastic! Thanks so much for the recipe! —They not only look tasty, they also taste delicious! —I just made these scones last night and they're very yummy. I'm having one toasted for breakfast this morning. Thank you for the recipe! —I made scones for the first time using your recipe. They were DELICIOUS! I even used skim milk and they were still great. I can't wait to try out more varieties. Your recipes and instructions are foolproof. —These scones are awesome! I made them for a bake sale at work and people loved them! —These were absolutely brilliant. I grew up on scones coming from a family with deep roots in the UK, but never cared for the sweet ones or raisins. This is the perfect recipe! Light and flaky and moist with amazing flavor. My 16-month-old is inhaling these...I may not have any for tomorrow! —I made these for a baking contest at work earlier this week and they disappeared!! —I just pulled these out of the oven. I altered the recipe for my taste, using garlic herbed goat cheese, caramelized onions instead of scallions, and added rosemary. They are delicious!!! Thank you for the recipe!! —Lest any of you doubt that these scones are not simply the best scones ever, I will testify under oath that they are indeed the best scones you will ever taste! —An old friend who has eaten his weight in these scones. P.S. Meyer Lemon (or Regular Lemon) Scones and Cranberry Christmas Scones (tasty any time of year!). © FarmgirlFare.com, where Farmgirl Susan shares recipes, stories, and photos from her crazy country life on 240 remote Missouri acres—and we're seriously into scones.